Aeroplan has once again brought back their partner transfer bonus that we saw in April 2014, November 2013, April 2013, November 2012 and so on. Basically what it entails is transferring points out of other select loyalty programs into your Aeroplan account. Just like in May, the offer is once again cumulative across all participating partners and the bonus maxes out at 25,000 miles again. 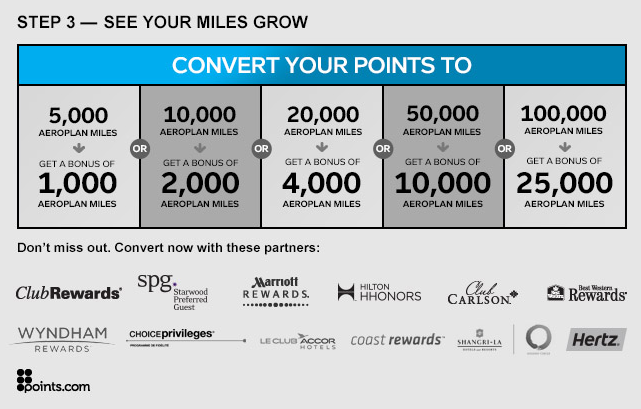 (We haven't seen the 40,000 miles bonus since April of 2013 so it looks like it may have gone the way of the dodo bird...) and there are no financial partners involved this time as well, for Canadians that is, Americans get Diners Club Club Rewards in that category. Basically you can transfer from partners like Starwood, Hertz and more (see the last graphic) and as long as the total Aeroplan miles deposited from all of them reaches one of the bonus target levels you will be awarded the respective bonus miles.